Masters in Cyber Security: Worth it for Someone Who Wants to Move Ahead? If you work in cyber security, you probably know how important your field is in our world today. Cyber security is the primary line of defense against cyber attackers who continue to find new ways to wreak havoc on our computing systems. Cyber security is a rapidly growing field for a reason: we need it to keep our information safe from criminals, and there are half a million cyber security job openings in the United States alone. As cyber security has continued to grow in scope and significance, you might have found yourself wondering if you're ready for more responsibilities in your own career. If you think you're ready for a management role, you might want to consider pursuing a master's degree in cyber security. You might think that getting a master's degree isn't necessary, since you already have a job. However, it's definitely worth considering if your goal is to rise through the ranks and land jobs in leadership positions. If you want to move on in your cyber security career, a master's degree might be exactly what you need. Here are some things to consider if you're thinking about getting a master's degree in cyber security. Are you ready to move up in your career? Maybe you're feeling restless in your current job and want more responsibility. Maybe you want to be the person planning cyber security strategies instead of just implementing them. Maybe you've always had your eye on a specific job and the time is right to make a move toward landing it. No matter what your reasoning, odds are you will know when a change is right for you. If you've been working in cyber security for a few years, you have probably developed some skills that weren't as well-honed when you began your job. Maybe you've found that you do well in leadership positions, or that you work well under pressure, or that you're good at coming up with creative solutions to complex problems. If you're feeling a bit restless with your current job and you have the skills to excel in a management or leadership role, that's a good sign that you're ready for something new. Can an advanced degree help you reach your goals? It's entirely possible that you can get where you want to go without going back to school. Maybe your career track has excellent odds of getting promoted directly to your dream job. On the other hand, if the job description contains skills that are not quite in your wheelhouse, it might be a good idea to consider getting that master's degree. A master's degree program could help you advance in your career in a multitude of ways. You will also learn about cyber security policy, which is essential for a manager to understand. You will also get the training you will need to earn important high level certifications, such as Certified Ethical Hacker and Certified Information Systems Security. These certifications are tremendously helpful in opening new avenues that you can follow in order to advance your career. Why go back to school in the first place? Simply put, if you plan to learn on the job your options for learning are going to be more limited than in a formal setting. While it's entirely possible that you can learn what you'll need to advance where you want to go in your current job, a formal education will allow you to tailor your expertise to the job you want instead of hoping you land a job with a favorable career track. Going to school puts more control in your hands and will probably give you a wide variety of opportunities. Cyber Security is a rapidly growing field, and whether you're just starting your career or are a veteran in the field, you want to have every possible advantage in order to make the most of your opportunities. According to the Bureau of Labor Statistics, the number of information security analyst jobs is expected to grow by 28 percent through 2026. In a market this competitive, a great education could give your career prospects a huge boost. Is a master's degree right for you? If you feel ready to move on in your career and want to see what a master's degree could do for you, ECPI University could help! 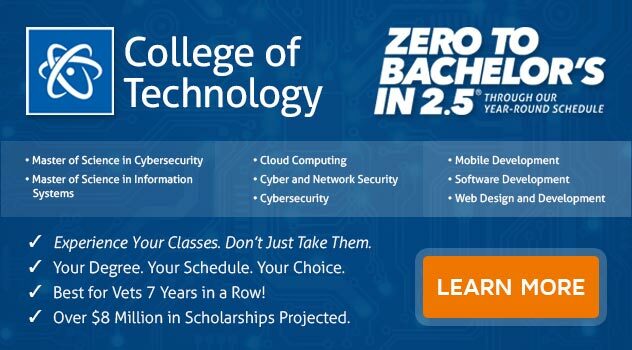 Our Master of Science Degree in Cybersecurity could be the stepping stone you need to reach your goals. For more information on our accelerated program, connect with a knowledgeable admissions officer today.